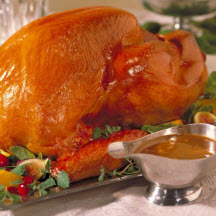 Classic roast turkey served with giblet gravy. Remove neck and giblets from body and neck cavities of turkey; set aside. Drain juices from turkey; pat turkey dry with paper towels. Turn wings back to hold neck skin against back of turkey. Place half each of the onion, celery, parsley and garlic inside body cavity of turkey. Place turkey, breast up, on flat roasting rack in shallow roasting pan; spray with cooking spray. Bake 3 1/2 to 3 3/4 hours, or until meat thermometer reaches 180°F (82.2°C) when inserted in deepest part of thigh, covering breast and tops of drumsticks with aluminum foil after 2 hours to prevent overcooking of breast. Meanwhile, prepare giblet stock while roasting turkey by placing the neck, heart, gizzard, water, salt and peppercorns in large saucepan. Add the remaining onion, celery, parsley and garlic; stir. (Reserve the liver for later use or discard.) Bring just to a boil over medium-high heat. Reduce heat to low; cover. Simmer 1 1/2 hours, adding the liver, if desired, for the last 30 minutes of the cooking time. Strain stock; cover and refrigerate until ready to use. Remove meat from the neck; discard bones. Finely chop neck meat, heart, gizzard and liver, if using; cover and refrigerate until ready to use. Remove turkey from pan; let stand 15 minutes before carving. Make giblet gravy by straining pan drippings from turkey into 4-cup glass measuring cup. Remove fat from drippings. Place 1/4 cup of the fat in medium saucepan; discard remaining fat. Stir flour into fat in saucepan until well blended. Add enough of the reserved giblet stock to pan drippings to measure 4 cups; gradually add to the flour mixture, stirring after each addition until well blended. Bring to a boil over medium heat, stirring constantly; cook and stir until slightly thickened. Stir in the reserved neck meat and giblets; cook until heated through.